A Trailer Tarp is an important addition to your truck as they should be used to cover your back bed and protect it from wind and rain whilst travelling along to your destination. Choosing a suitable product to the loads you normally carry will help ensure condition of your tarp stay high for years to come. The options available to you are vast and vary from company to company. 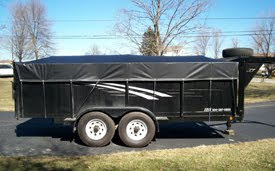 Utilizing the internet and using a few choice keywords you can find an abundance of companies that specialize in trailer tarps and them take your time and narrow the results down to a few companies that offer services that suit your needs. Contact them all and ask for advice from professionals who will gladly point you in the right direction. Depending on the type of protection you need your trailer tarp to offer, you can choose many different manufacturing materials which each have their own positives and negatives. Polypropylene for example has the great property of being repellent to Ultraviolet light to protect the products contained underneath. It has one downside which would be that if a sharp object tears a small hole, its inherent structural weakness can cause the damage to grow rapidly. Canvas tarps on the other hand should be quite tear resistant though if not properly cared for after getting wet the dampness left behind can cause it to rot causing structural weakness in the tarp. Another point in favor of canvas tarps is that production methods are often more environmentally friendly. Whichever trailer tarp you choose to purchase, if cared for properly will happily do its job for years to come. One last thing to consider is extra web strapping; this should also help prevent your tarp from tearing in transit due to wind pulling it around. Good trailer tarps are hard to find. You had some good tips in this article thanks. All About Tan Mesh Tarps.